This is Kevin Davis from the Idaho Panhandle National Forest Avalanche Center. Today is April 12th, 2019, and this is our last update of the season. The following are some helpful hints to guide you in your spring trips to the mountains. But first, our thanks to our partners in avalanche education, Idaho State Parks and Recreation. 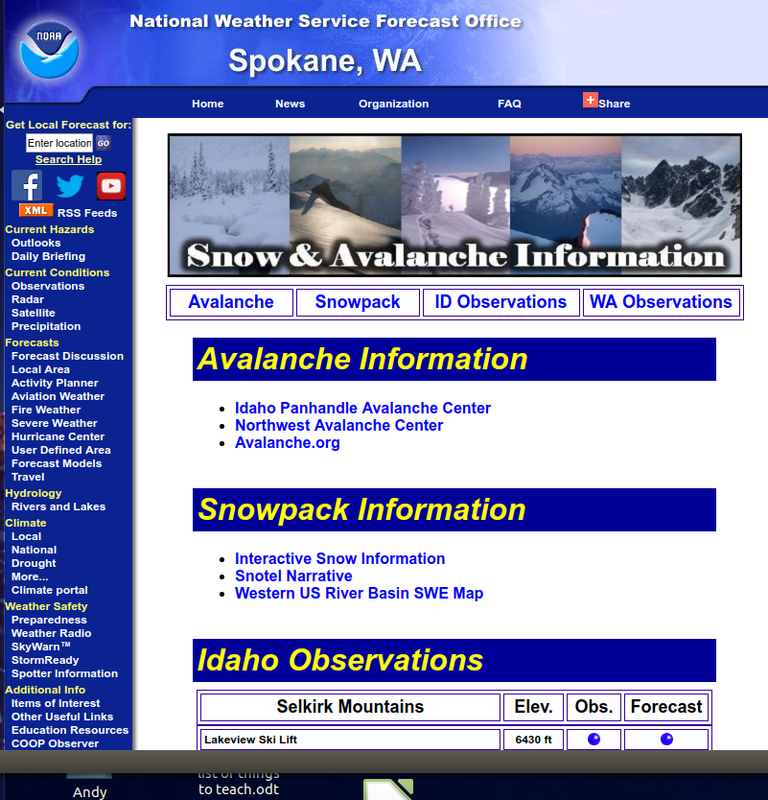 Thank you to the Spokane National Weather Service for posting advisories on their NOAA website to alert winter travelers of high avalanche danger. We had another great winter of collaboration on avalanche classes and you can count on us continuing and expanding that in the future. Thanks to Schweitzer and Lookout Pass for allowing us to conduct classes on mountain. Thanks to Silver Mountain and Panhandle Backcountry for the Backcountry days avy education. IPAC would also like to thank those that assisted with our avalanche observations; Silver Mountain and Schweitzer Mountain Ski Patrols, and Lookout Pass Ski Area, Tom Eddy and everyone who phoned in or emailed us, your assistance is invaluable and we enjoyed working with you and look forward to working with you in the coming winters. Spring is generally a safe time to travel in the mountains but there are some rules to live by. The safest and best conditions will exist after a good nighttime freeze. Dig a pit to see how deeply the freeze penetrated. This will give you an idea of how quickly the snow will become slushy and unstable. Get on the slopes early before the temperatures get too warm or the sun gets too intense. Mountain temperatures above 50 degrees should be an indicator that conditions are becoming unstable. Strong radiation can penetrate deep into the pack and destabilize weak layers. Steep south facing slopes are affected most rapidly by strong sun. If you are into the slush up to your boots or you’re laying on the throttle to move its time to get off the slope. By planning your route to take you to slopes just as they come into the sun and begin to thaw you can enjoy good, safe sliding. Always be careful around rock outcroppings because they hold heat and weaken the snow for some distance around them. Rain always weakens the snow pack and this time of year rain can lubricate ice crusts making the overlying layers more prone to slide. When we do get new snow watch for the type of surface it is bonding to. New snow on an ice crust that is experiencing melting during the day can be extremely unstable, especially if it is wind-loaded. In general, new snow will be more sensitive to radiation. Surface hoar can also be a weak layer in the spring so check under the new snow accumulation to make sure you’re not dealing with that little devil. In steep terrain you may notice glide cracks where a fracture in the snow has opened up, often to the ground. The snow is gradually creeping down hill and stability above and below these areas is highly unpredictable. Finally, keep track of extended periods of thawing, not only during the day but most importantly overnight. This will also decrease snow stability. Night-time temperatures below freezing are a must for good sliding conditions, and safe sliding conditions. The more nights in a row that freezing conditions occur, the more stable the snow is likely to be. Freezing conditions will usually accompany clear nights while overcast nights tend to trap heat. In the high country we’re holding on with snowpack with Bear Mountain at 70%, Schweitzer at 75%, and Hidden Lake at 69% of average peak snowpack to the north. To the south Lost Lake has 79% and Lookout Pass has 83%. 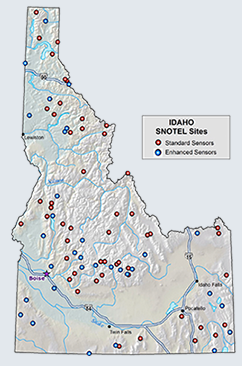 In Montana on the Kootenai Poorman has 94%, Hawkins lake has 98%, and Banfield has 81% of average peak snowpack. Winter weather is expected in the mountains for this weekend and will continue into next week so be thinking about potential slab avalanche conditions with new snow and for a 24 hour period after the storm. Check to see if the new snow is loading up over a layer of surface hoar. On your ventures into the high country remember to respect old terra firma, the brown stuff, that sticks to your boots and tracks on the way up. Don’t rut up the roads and trails in your truck or ATV trying to get an extra 100 feet. Park before you get to the muddy sections and try to avoid them as much as possible. Just like your tracks in the snow, leave no trace. Have a great spring. We’ll be back next year with the first winter snows. Have a safe and pleasant spring!